"How to Triumph Like a Girl", a poem by the dynamic Ada Limón, won’t get out of my head (and I don’t want it to). I read it the day after the election and it stuck fast. I sent it to a few friends, read it five or six times, and have kept reading it since. Though it was published a few years ago, it seemed like the exact poem for that exact day. I wasn’t feeling girl power-ish or triumphant in the least, but the galloping, the beating heart were vital signals saying, You are breathing. Be thankful. When poetry is at its best, it does these things, broadens itself to the reader’s understanding; acts as a flag waving on the stark, broad sea; and for a lack of less dramatic phrase, changes our understanding of the world. Sometimes it’s worthwhile to seek poems that feel like our very own, ones that are so familiar, we barely need to study their language to understand them. Their imagery is our imagery. But in recent years, I’ve found that searching out poets with voices, circumstances, and lifestyles different from my own is one of the best ways to deepen my understanding of the craft and of our many-faceted country and its climate. That may sound obvious, but as we move deeper into the internet age, when an online search can give back to us anything we hope to hear or conversely, an enormous overload of conflicting voices, it helps to spend time in deep refection of that which expands our thinking. As a middle-class, cis-gendered white woman, I have a lot to learn about the experiences of those, not just across the country, but in Philadelphia, and even in my very neighborhood. Getting in the practice of reading in order to listen helps me better understand what role I should take in the midst of the country’s ongoing conversations on race, policy, gender, violence... And that role, in some part, is to engage in the listening. A few of the poets whose work I’ve most enjoyed this year help me do just this. Check out J. Mae Barizo, Gabrielle Calvocoressi, Jamaal May, and Cathy Park Hong. (No seriously, I mean check out some of their books from our catalog.) And for sure, check out Philly’s Poet Laureate, Yolanda Wisher. Yolanda’s poems are powerhouses of song. In fact, many of the pieces in her recent book Monk Eats an Afro are titled as songs. She is interested in poetic lineage, myth, and history and how they intertwine, the very shape and sound a poem makes on and off the page, and a ton more. We’re fortunate enough to be welcoming her to the Free Library on December 5 as part of the Monday Poets Series, when she’ll read with Alfred Encarnacion. Come and hear them! 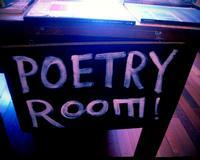 Want more info on the city’s Poet Laureateship? It’s coordinated by the City’s Office of Arts Culture and the Creative Economy and supported in partnership with the Free Library and other organizations across the city. Join the Monday Poets Series on December 5 as the Free Library welcomes Yolanda Wisher and Alfred Encarnacion. This is a very short, fundamental piece of criticism: poetry "...acts as a flag waving on the stark, broad sea." Wonderful phrase.